Superb 20-track collection of singles, compilation appearances, and unreleased tracks from London pop duo The Pines - a collaboration of legendary American songstress Pam Berry and amiable English gent Joe Brooker featuring strong songwriting, intricate guitars, and exquisite harmonies. Joe is a prolific songwriter and one-half of English pop duo The Foxgloves, while Pam’s distinguished resume includes association with notable indie bands of the last decade including Belmondo, Black Tambourine, Bright Coloured Lights, The Castaway Stones, Glo Worm, The Seashell Sea, The Shapiros, The Snowdrops, and Veronica Lake, plus guest spots on recordings by The Clientele, Jasmine Minks, The Lucksmiths, The Relict, and The Saturday People. 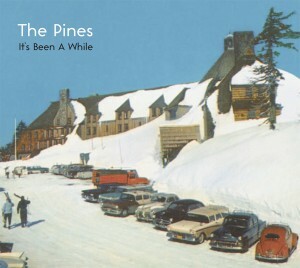 Beginning in 2000, The Pines released a series of limited edition singles for esteemed record labels Annika (Spain), Becalmed (UK), Foxyboy (USA), Gifted (Australia), Long Lost Cousin (UK), and Matinée (USA) and contributed compilation tracks to collections by Chickfactor (USA), Papercuts (UK), and Red Square (USA). In addition to highlights from these releases, ‘It’s Been A While’ includes three songs from an extremely rare self-released Christmas CD and unreleased covers of songs by Young Marble Giants and The Cat’s Miaow. A truly essential release for your 2007 shopping list!